Do you remember this guy? Typically printed on dozens of posters through out your school and classroom? Sometimes he wore a bow tie, a graduation cap, or even had a rainbow derriere. #bookworm is a popular hashtag, and it got me thinking, where did this term come from? 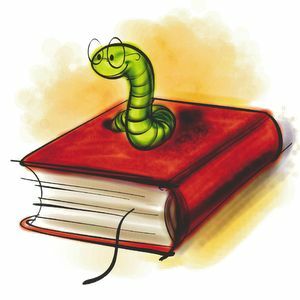 Who deemed the worm the mascot of book readers? Why not a #booklion? Or the very intelligent bumblebee; I like #bookbee. Well… book worm is derived from tiny icky bugs who get jollies off devouring the pages of our precious book pages. Examples: moths, black carpet beetles, Larva Death Beetle (wtf), and tons more. But not worms. THIS is what these little buggers (lol) do! They make tunnels like worms do. Catastrophic ones, at that. Anyways, now you know. And even though bookworms are assholes, i’m still okay with being deemed one. Plus, its too much work to spread the word.